Last admission is at 16:30. 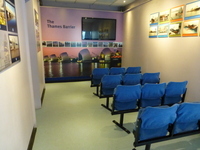 Monday to Wednesday is for pre-booked groups and conferences only.. The venue is situated outside the centre of the area. 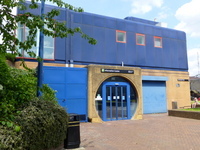 This venue is situated in Woolwich. There is not a bus stop within 150m (164yds) of the venue. The nearest mainline station is Woolwich Docklands. The car park is at the front of the venue. There are 3 designated parking bay(s) within the car park. 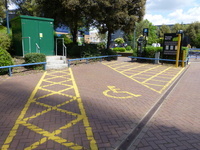 The dimensions of the designated parking bay(s) are 350cm x 600cm (11ft 6in x 19ft 8in). The nearest designated bay is 15m (16yd 1ft) from the exhibition direct entrance. The furthest designated bay is 20m (21yd 2ft) from the exhibition direct entrance. There is a dropped kerb / non stepped access from the car park to the venue. The car park is open 7 days a week. You are on Outside Access (Exhibition Direct Entrance). Skip to the next section. This information is for the entrance located at the front of the building at ground level. The door opening is 140cm (4ft 7in) wide. 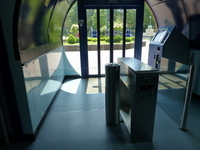 Inside the entrance there is an automatic ticket machine. After the machine there are security barriers. The wide gate is 99cm. The standard gate is 55cm. 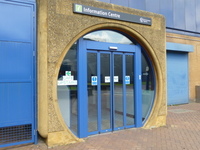 On the day of our visit this entrance was closed as the ticket machine was temporarily out of order. 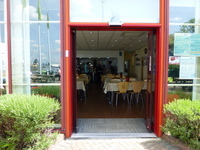 You are on Outside Access (Cafe Entrance). Skip to the next section. This information is for the entrance located at the front of the building at flood wall level. The door opening is 110cm (3ft 7in) wide. 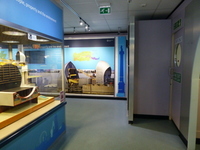 An additional entrance direct to the exhibition is available on the ground floor. Tickets for the exhibition can be purchased in the cafe. From the cafe there is access to the internal stairs down to the exhibition. You are on Level Change (Cafe Entrance). Skip to the next section. The ramp or slope is located on the river side of the building, leading to the entrance from the lift. 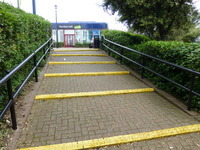 The steps are located leading to the entrance to the left of the building from the car park. 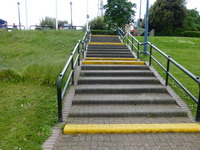 The ramp or slope does bypass the steps. 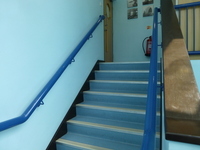 The stairs are in the form of a stepped ramp. The lift is located at the right side of the building. The lift is 19m (20yd 2ft) from the cafe entance. 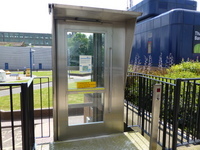 The clear door width is 90cm (2ft 11in). The dimensions of the lift are 110cm x 130cm (3ft 7in x 4ft 3in). The lift does not have a visual floor indicator. The lift does not have an audible announcer. On leaving the lift there is a ramp to the cafe level. The lift was out of order on the day of our visit (May 2014). You are on Inside Access (Exhibition). Skip to the next section. Music is played on the ground floor exhibition space. You are on Restaurant Bar Internal (Cafe). Skip to the next section. 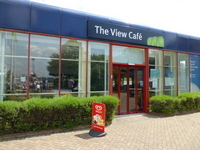 The following information is for the cafe. 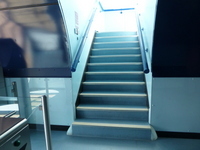 Once inside, there is level access to the service. Food or drinks are ordered from the counter. There is not a lowered section at the service counter. 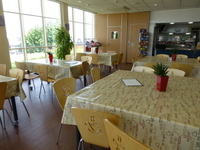 The nearest table is 3m (3yd 10in) from the cafe entrance. The distance between the floor and the lowest table is 75cm (2ft 6in). The distance between the floor and the highest table is 75cm (2ft 6in). Menus are hand held and wall. There are also picnic benches on the terrace outside the cafe. 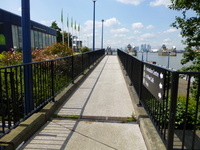 You are on Level Change (Access To Thames Path). Skip to the next section. The steps are located from café terrace to the riverside path. 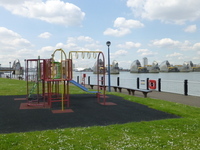 There is a play area and further picnic benches at the level of the riverside path. These stairs link the cafe and the exhibition space. 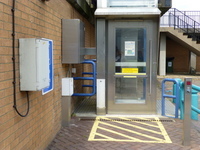 The external lift overcomes the stairs. 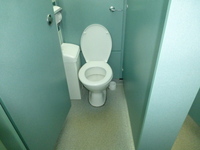 This accessible toilet is approximately 11m (12yd 1in) from the lift. 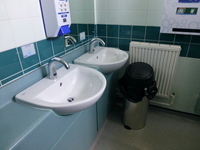 This accessible toilet is located outside, on the ground floor to the right of the building. A key is required for the accessible toilet. The key is a radar key. The key can be obtained from cafe staff. 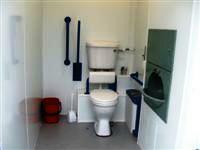 The dimensions of the accessible toilet are 117cm x 215cm (3ft 10in x 7ft 1in). The lateral transfer space is 60cm (1ft 12in). The tap type is sensor. Disposal facilities are not available in the cubicle. There is not a mirror. The hand dryer can be reached from seated on the toilet. Baby change facilities are located in the first aid room on the ground floor. The female and male toilets are located on the right as you enter the cafe. The female and male toilets are 6m (6yd 1ft) from the cafe entrance. Inside the venue, there is level access to the female and male toilet. There are additional standard toilets at ground level. Access is from the outside to the right of the building. Staff are Text Relay aware.